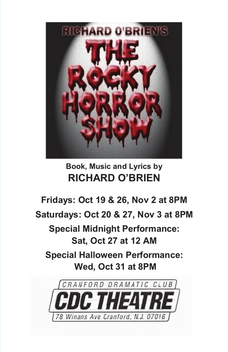 RICHARD O'BRIEN'S THE ROCKY HORROR SHOW is produced by special arrangement with Samuel French, Inc. New York City. On the way to visit an old college professor, two clean cut kids, Brad Majors and his fiancée Janet Weiss, run into tire trouble and seek help at the site of a light down the road. It's coming from the Frankenstein place, where Dr. Frank'n'Furter is in the midst of one of his maniacal experiments. Follow squeaky-clean sweethearts Brad and Janet on an adventure they’ll never forget, with the scandalous Frank'n'Furter, rippling Rocky, and vivacious Magenta. Get ready for a night of fun, frolics, and frivolity. It’s the biggest and baddest rock ‘n’ roll musical ever! Bursting at the seams with timeless classics, including “Sweet Transvestite”, “Damn it Janet”, and of course, the pelvic-thrusting “Time Warp”, Richard O’Brien’s The Rocky Horror Show is a non-stop party! * - The November 2 and November 3 performances were cancelled due to hurricane (Sandy). ** Halloween themed, patrons are encouraged to come dressed in Halloween costumes.